August was also extremely warm and extraordinary dry. The average temperature 20,8°C was by 2,5°C higher than long-term average thanks to 15 tropical days and another days with temperature above 25°C. Aggregated precipitations 18,7 mm represented only 28 % of the usual volume. Hot and dry weather character was supported by intensive sunshine which exceeded long-term average by 39 hours. Due to the prohition of water usage for hop irrigation the situation became more complicated. Extremely hot weather negatively influenced the growth of hop cones in both months July and August so cones remained rather smaller. Hop harvest started rarely at the end of the first decade of August, in the most of hop farms in the middle of the month. 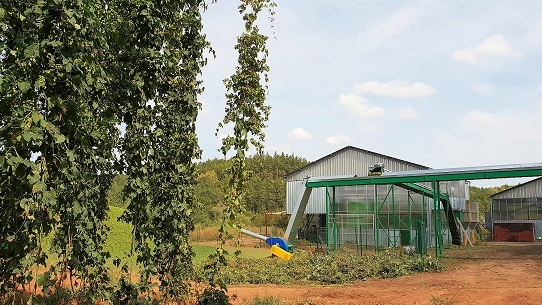 The health state of hops was good in farms where the appropriate treatment against Red Spider Mite and Peronospora was applied and the spread was maintained at minimum level. In other places the harmed hop cones negatively affected the yield and quality of harvested hops. It is obvious that crop 2018 will be significantly lower compared to previous years. The production failure is expected by 30-40 % lower against last year.